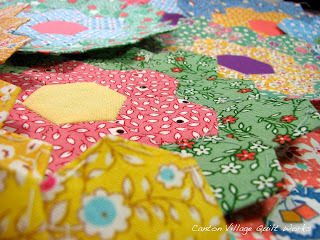 Canton Village Quilt Works | What Do You Do When You Have Time???? What Do You Do When You Have Time???? Yes, I had some time! Granted, they were stolen moments here and there, but none the less, it was time. So here are a few of the things that I was able to accomplish. 1. I opened an Etsy Shop! Yay, I am excited. You can check it out from the button on my sidebar or just click here. 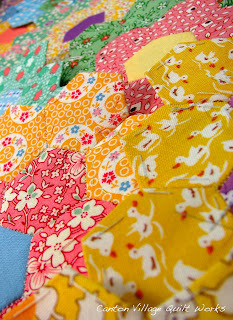 My main focus will be die-cut fabrics in all forms, strips, squares, circles, dresdens, drunkards, you name it! I will do custom orders too! 2. 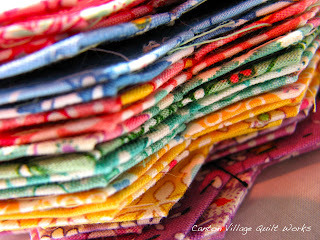 I finally updated my website gallery with new customer quilts. Check it out here. I am so behind. So if any of you are still waiting to see your quilt there, I promise it will be there soon. It was the perfect time to work on my Grandmother's flower garden. 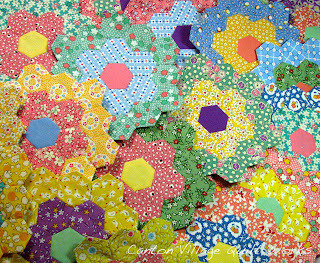 I basted hexagons. I quickly went up to 20 flowers. Now I know that I need 96 total for the project that I am doing, but I would say being approximately 1/5 th done is pretty good. I just love the little stack. In my journeys, I was able to find this little packet of finger saving heaven. 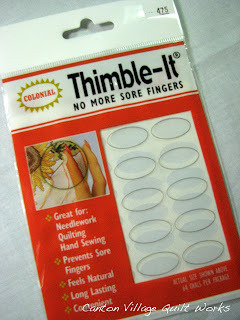 I don't know about all of you, but I never could get used to a thimble. So my finger has gotten callused and an occasional hole from the needle. OW! So these little gems are a real helper. You just peel them from the paper and stick them to your finger. At first it takes a little getting used to, but then you don't even know they are there. And the best part no more holes in my finger. You can find them online by clicking here. 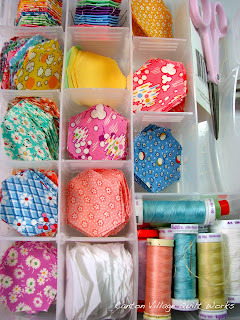 Oh and here is a picture of my little tackle box filled with new hexagons to baste and sew. So, in conclusion, this is what I do with those stolen moments here and there. Not bad! I would love to hear from you, what do you do in those little moments that you might have?